The colors of the tiny Ligurian ports bring light and vibrancy to the range of Portofino appliances, with models which harmoniously combine the lightness and brightness of Mediterranean hues with the raw strength of stainless steel. Their Portofino range features an extra-large 4.5 cu., ft. oven capacity, offering increased space and versatility for those wanting to optimize cooking times for several dishes placed in the oven simultaneously, without mingling flavors and odors. The eco-friendly Vapor Clean function facilitates cleaning through the use of steam. This steam is generated by inserting a small amount of water into the groove in the cavity, with no need for chemical additives. This proves also uses less energy. The special anti-acid Ever Clean enamel facilitates the oven cleaning process, decreasing the adhesion of fats to the walls courtesy of the reduced porosity of the surface, increasing the brightness. The oven is equipped with an exclusive three fan system, which, combined with the increased power of the motors, enables excellent cooking performance. The two large side fans distribute the air around the outer perimeter of the cavity while the smaller central fan increases ventilation by creating a vertical vortex of heat. Accordingly, the temperature within the cavity is uniform, allowing food to be cooked evenly on all five levels, like in professional kitchens. Characterized by its unique shape, with rounded corners and smooth, uniform walls, for maximum thermal insulation and optimal energy performance. Ther perfect insulation of the cavity also helps reduce pre-heating time. The multifunction version, for example, reaches a temperature 392 degrees F in just 8 minutes, a time saving of 50% compared to a standard oven. The different cooking levels enable maximum flexibility of use, and allow different courses to be cooked simultaneously. This enables users to optimize the time spent cooking, preparing multiple courses quickly and efficiently while preserving distinctive flavors. 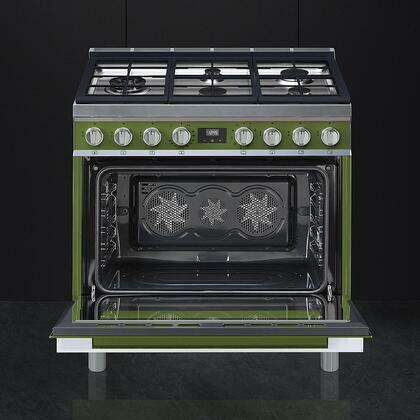 The multifunction version of the Portofino cooker features a triple-glazed door, which helps to keep the exterior of the oven at room temperature during cooking. A kit consisting of fully-removable telescoping guides is included, and allows trays and racks to slide in and out easily, facilitating their extraction. 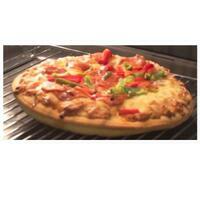 The guarantees maximum safety and accessibility, avoiding the need to put your hands directly into the oven. The oven door is equipped with a Soft Close system which closes the door in a silent, soft motion with no need to push it. The solid cast-iron grids cover the whole cooktop, creating a harmonious and ergonomic surface onto which pots can be placed and moved safely and securely. In addition to providing a highly professional look, these ensure excellent performance, which remains unaffected over time. The dual ultrarapid burner consists of a double crown, which combines an ultrarapid burner with a auxiliary burner reaching a maximum of 20000 BTUs. Equipped with solid, heavy-duty cast iron grids, covering the complete surface of the range. This extends the support surface to a maximum, providing an aesthetic, functional solution which is perfectly aligned with the countertop, as well as sitting flush with modular units to create a streamline effect. The linear and ergonomic design approach to cooking. The colors of the tiny Ligurian ports bring light and vibrancy to the new range of Portofino appliances, with models which harmoniously combine the lightness and brightness of Mediterranean hues with the raw strength of stainless steel. True European triple fan convection makes preheating 50% faster. Vapor Clean is an assisted cleaning procedure which facilitates the removal of dirt. Thanks to this process, it is possible to clean the inside of the oven with great ease. The dirt residues are softened by the heat and water vapour for easier removal afterwards. 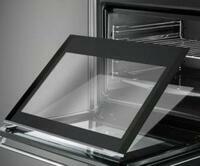 The removable inner oven glass makes cleaning buildup from baking or broiling easy. Smeg’s Cool Door is one of the safest and coolest oven doors available. 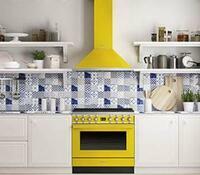 Featuring a triple-glazed door, which helps to keep the exterior of the oven at room temperature during cooking. Heavy cast iron grates cover the maximum usable space of the cooker and guarantee constant performance over time. The linear and ergonomic design helps provide the cooker with both a professional look and a professional approach to cooking. 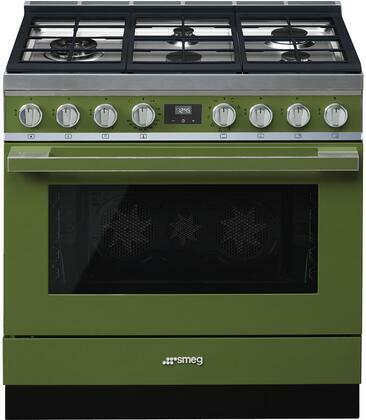 I really shopped around and read a lot of reviews before choosing this Smeg Dual Fuel range. 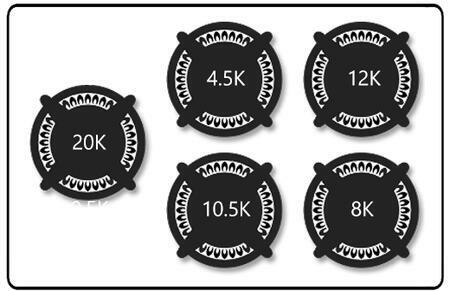 This gas range has several different size burners for all your cooking needs. 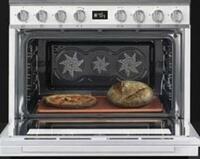 The oven preheats within 5-6 minutes. I am a satisfied. It is easy to operate, and the surface cleans well. The stove is an excellent product. At this point, it appears to be very well made, and performs its tasks as advertised. This is exactly what I wanted color and size-wise-- plus all the features of a more expensive Dual Fuel range. So nice! Way better than my old range. Baking a roast and cookies or dessert at the same time. Preheat helps make sure temp is correct and time bake provides convenience. Get to work with this range in my new apartment and I love it. Very easy to clean and make my food delicious. We got all new appliances from Smeg! Love the more modern look and fancier features. And once you get the hang of cleaning the range, it's very easy to take care of. The range is durable as well as beautiful. Easy to clean. Great features. Super happy with it. Highly recommended. 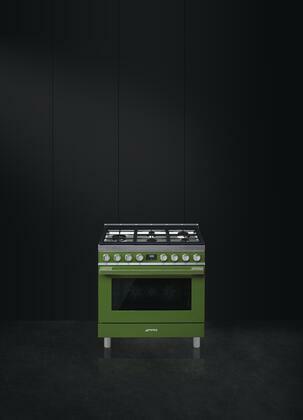 This Smeg stove is the best. The simmer burner works great and the quick boil burner is awesome. Oven Heats up quick and bake everything with perfectly. A great sale price for a Dual Fuel range. Love the range; it does everything that was advertised, and meets our needs perfectly. Love the burners. Easier to clean spills. Even heating in oven. Great stove at a great price. Awesome range top with plenty of room for a big meal. The cooking time is so fast and I love cooking again. The family says the food test better my baking is much better.